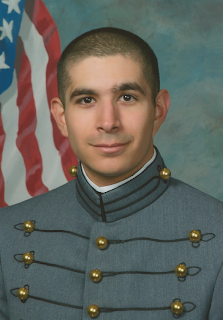 WEST POINT, N.Y. – Francisco “Frankie” Javier Barrera, son of Mr. & Mrs. Guadalupe E. Barrera Jr. of Rio Grande City, Texas, graduated from the U.S. Military Academy on May 26, 2012. Barrera graduated from Rio Grande City High School in 2007. While at West Point, 2LT Barrera received a Bachelors of Arts Degree in Latin American Studies with a minor in Nuclear Engineering. He was commissioned as a second lieutenant (2LT) in the U.S. Army within the Armored branch. He will initiate his army officer career at Fort Benning, GA and attend the Armored Officer Basic course and the he will proceed to his follow on assignment with the 3rd BCT (Brigade Combat Team) at Fort Bliss, TX. Frankie continues his family lineage of military service to our country and who have served in every major conflict our country has endured. His father and his 4 uncles have served in both the U.S. Army and the U.S. Air Force. Two of his uncles are officers in the US Army and hold the rank of Lieutenant Colonel and both served in the Operation Iraqi Freedom and Operation Enduring Freedom in Afghanistan. One of his uncles also served in Operation Desert Shield/Storm. His has one great-grand uncle who served in WWII in the pacific theater, two great uncles who served in the Korean conflict and numerous uncles who served during the Vietnam Era conflict. Frankie is the first Rio Grande City High School graduate (Rattler) to attend and graduate from the US Military Academy at West Point, New York. Frankie’s attendance to West Point has opened the door and inspired other RGC students to attend the academy. Best wishes to 2LT Barrera as he enters military service. The U.S. Military Academy is a four-year co-educational federal undergraduate liberal arts college located 50 miles north of New York City. Founded in 1802 as America's first college of engineering, it consistently ranks as one of the top colleges in the nation. A pre-eminent leader development institution, its mission remains constant - to educate, train and inspire cadets for careers of professional service to the Army and the nation. For more information go to www.westpoint.edu.